We here at SDE Weddings, Toronto’s premier wedding videography and cinematography group, believe in the old proverb of ‘beauty in simplicity’. Sometimes, simply cutting through the ornate and ostentatious reveals an austere beauty that is often overlooked, whether through a videographer’s lenses or in the memory of a mind’s eye. A couples’ first smile shared after the sharing of vows, the telling gestures of a nervous groom as he fixes on his wedding day wardrobe, the slow procession down the aisle and the obstinate anticipation for what awaits ahead. 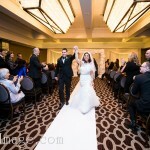 All these simple yet profound scenes were part and parcel during our work with Maria & Alessandro on the auspicious occasion of their wedding day just this past October 18th, 2014 at Mississauga’s St. Francis of Assisi Catholic Church, with a ‘grand’ reception aptly set in the Embassy Grand Convention Centre in Brampton. Needless to say, Maria & Alessandro’s wedding day ceremony and celebration stood out for our videographers and cinematographers as an opportune event in showcasing their ability to create and capture the lasting beauty of a wedding day, in all of its perfect details, through full-day footage filming and in our signature Same-Day-Edit service for screening at the couples’ reception. Have a glance at the highlight reel our videographers and cinematographers prepared for Maria & Alessandro, which you can find below, and read more about our crew’s wonderful experience in filming Maria & Alessandro’s unforgettable wedding day. The early morning of a wedding day is without a doubt the most turbulent time for our videographers and cinematographers. Between setting up and getting the perfect shots, more often than not, the morning’s momentum is what steers the course for the entire day’s worth of filming and cinematography. And in this case, the most ideal shots to use for the Same-Day-Edit prepared later during the day. However, in working with Maria & Alessandro, getting into the groove of filming for their wedding day was hardly a tumultuous task. Apart from a gorgeous scene of Maria descending down a flight of stairs as she’s welcomed by her family, one of our favourite morning shots was of a sequence that juxtaposed Maria & Alessandro picking their main wardrobe piece, which you can view in the highlight reel. Overall, the ‘traditional’ wedding wardrobe and dress for both bride and groom was a sharp choice, and our videographers made sure to capitalize on this in filming a few of their signature scenes; in particular, the wedding gown’s shimmering white silk contrasted with the piercing green of Maria’s vine-covered brick wall was a lovely one also featured in the highlight video. With preparation complete, and perfect morning shots taken, it was time to head for the main event. In traditional Catholic fashion, Maria & Alessandro were wed to a full hour’s missal service, all taking place in the beautiful St. Francis of Assisi Catholic Church in Mississauga. Our cinematographers had chosen to feature the couples’ vows in the highlight reel and Same-Day-Edit, which was an especially sentimental touch that scored plenty of points with the evening guests. A slow-motion walk back down the aisle and a full shot of the wedding congregation congratulating Maria & Alessandro just outside the church doors were our highlight moments for the ceremony. Indeed, with an entire crowd united in smiles, you can’t help but be drawn to such a contagious energy! The last of our ceremonial shots which our videographers were extremely proud of was of the couple making a slow stride out of the dimly lit chapel walls and transitioned in editing to Maria & Alessandro making their grand entrance at Brampton’s Embassy Grand Convention Centre for their wedding day reception and celebration. With a lovely first-dance to pull the heartstrings, Maria & Alessandro made sure to make their first night of many as memorable as possible. In doing so, our Same-Day-Edit was featured during dinner services, to the applause of the crowd. 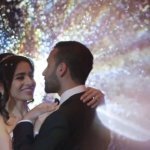 All in all, Maria & Alessandro were an ideal couple to work with for our videographers and cinematographers, and their wonderful wedding day from first minute to final moments were an utmost pleasure to film. We here at SDE Weddings, Toronto’s premier wedding videography and cinematography group, wish the Maria & Alessandro the very best in their future endeavours, and hope that our work for them serves as a much treasured reminder of their beautiful wedding day for many years to come.